Google Android surged past RIM BlackBerry to become the most popular smartphone platform in the US, accounting for 31.2% of market share as of January 2011, up 7.7 percentage points from the previous three-month period, according to data from the comScore MobiLens service. Ranked second, RIM accounted for 30.4% of market share as of January, down 5.4 percentage points (PPs) from the previous three-month period, followed by Apple with 24.7%. Microsoft and Palm both lost ground as of January, accounting for 8.0% and 3.2%, respectively. 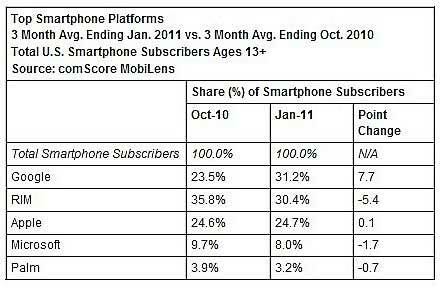 Some 65.8 million people in the US owned smartphones as of January, up 8% from the previous three-month period.